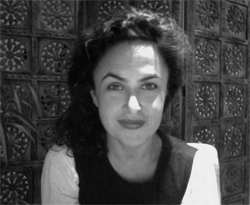 British Palestinian author Selma Dabbagh’s first novel, Out of It, provides a fast-paced, breathless ride through the political and emotional turmoil of living in the world as a Palestinian. Set in Gaza, London and the Gulf, the novel traces the twists and turns in the lives of a pair of twenty-something siblings and their family members as they negotiate an inherently politicized life. One of few English-language novels set in occupied Palestine, Out of It provides a powerful emotional introduction to the conflict and a glimpse of life in one of the most closed-off and besieged corners of the world. I had the pleasure of speaking with Dabbagh, whose previous short stories have appeared in anthologies published by Granta and the British Council, near her home in London. We discussed her upcoming projects, the origins of Out of It, and the complications of writing about Palestine as a Palestinian. Helen Stuhr-Rommereim: You said in a recent interview that that the idea for the novel came from this image of a boy leaping on a roof. I was wondering where that image came from and how it led to the story that became Out of It? Selma Dabbagh: I am not sure where the image came from, exactly. Images just appear in your head and some of them get stuck there. I started writing the book in 2003. I had just started writing short stories and loved the form, but I knew I wanted to write a novel. The Iraq war was really dominant in the news at the time. I was thinking about this young man, an urban, savvy type of Arab guy, like friends of mine — the character that became Rashid. I had this idea of him on a roof under a fighter jet, feeling frustrated and trapped by the situation, yet defiant at the same time. My mind was flooded with the accounts of the attacks on Jenin, incidents in Lebanon, Iraqi bloggers, and other reports I was reading. The sense of the situation was that it was a dangerous but familiar one, there was an idea of him being literally mentally out of it, hating the situation while smoking a joint and trying not to care. I started developing the image into a slightly abstract, high-level reality short story that was a little bit futuristic, with a blurring and merging of different textures and contexts. I didn’t want the characters to have names, just letters — based on a Roberto Bolano short story I had read, “Last Evenings on Earth” — because I thought it could disconnect Western readers from the prejudices they might feel towards the Arab world. At the time, after 9/11, Islamophobia was so strong. The short story didn’t really work on that level, although some readers got excited about it, but it had this feeling in it of being trapped, having competing factions — characters trying to find a way to engage in their situation and their frustrations at not being able to. I felt that this was the gut sense of the novel I wanted to write and I started to pull more out of it. That image made me think in particular about the end of the book — this suspended moment. It is a strange and intense ending, and it left me holding my breath. The novel as a whole is exciting and suspenseful, it moves quickly, and there is a lot of mystery and intrigue. Was that intentional? I am glad you felt the connection between the two images. That was deliberate. And one of the difficulties of dealing with Palestine in a fictive way is that everybody goes towards the Israel/Palestine conflict feeling like it is going to be a painful, heavy story — which it is on many levels — but I wanted somehow to draw people in to what is seen as this intractable problem with youth, energy, movement. The Palestinian population is very young — half of the population of Gaza is under 18, for example. The novel starts with the scene on the roof, the boy leaping up against the enemy plane above him and it ends with him running. It is not a bleak ending, but it is not conclusive, and that was also important. Although I started out somewhat naively with all these ambitions to write an uplifting Palestinian “message novel,” the more I went through the writing process, the more essential I found it to leave the question marks in. I didn’t want to feel like the novel was directly speaking out with one definitive point of view, because when that happens, people stop thinking about the characters and start to feel like they are being dictated to by the author, and the continuous, believable, dream-like state that the writer is trying to create in the mind of the reader gets broken. As the process went on, my ambitions of portraying multiple aspects of historical reality and the Palestinian cause were reduced and gradually cut out. The personal story overrode the original, political information-providing objectives that I originally had. For me, if the novel had a message it was more about showing the human experience of the conflict, and the way that it acts on people whether or not they are choosing to engage with it. Since you wrote this kind of book for an English-speaking audience and are Palestinian yourself, did you feel like you carried a burden of representation? How did you deal with that? I did, not that anyone asked me to write it or even knew I was writing it, but you do have a feeling being Palestinian, or really for anyone concerned with Palestine, that there is an incredible urgency about the injustice of the situation. The feeling Palestinians have is that we don’t have the military might on our side, we don’t have the power, or even the political leadership, but what we do have is a strong case, morally and legally. There is this sense that you have got to put every little bit of effort into conveying this case to combat the myths depicted by those who do not want your reality, or your existence, to be known or recognized. I was concerned in my head throughout the writing process about potential criticism from Palestinians. That was quite inhibitive at times, I kept thinking that people would turn around — particularly people from Gaza — and say “What do you know? You haven’t been here for ten years.” But it was just impossible for me to go. Gaza is under siege. I wanted to write about it; I did not want to get it wrong, but I couldn’t get there and this influenced the style that I used. It became a more impressionistic depiction of place, of a state of war, siege, closure. My imagined Gaza was real to me. I also had this issue in that I have always been passionate about Palestine and always been passionate about literature, but what I read of Palestinian literature in translation, with the exception of Ghassan Kanafani, Emile Habibi and Sahar Khalifeh and some others, I was not as excited by. Often there is this need to present Palestinian characters without flaws, which is implausible, and it makes for poor literature. You get really flat characters, and it becomes a bit like Soviet Realism — literature that is propaganda. How can you build tension if you know all the way through that the proletariat or whoever will invariably triumph in the end? That issue comes up in the novel a little bit, when you have Rashid and his British girlfriend Lisa, who’s an activist, out to dinner in London with a group of people, and Rashid starts talking about weed, and Lisa scolds Rashid for not representing himself as a kind of ideal poster boy for Palestine. I got a bit criticized for Lisa as an anti-British stereotype. But with her, I felt that she was forcing back on Rashid the need to have a political conscience and to be acting politically, which was critical for the main theme of the book: how do people respond to this expectation of engagement? What do they do to further the cause, what does this do to them, what do they do when they want personal space and are not interested in engaging in the situation, especially when the situation is so hard to engage with? This struck me at a wedding that I was at in Amman. Everyone had just come out of Gaza, and it was after the first air strikes, and they were trying to have a party before the wedding. It was a complete failure of a party. One young, good-looking man, came into the kitchen and was crying. He said that his girlfriend was Christian and that he was Muslim, and so he could not marry her. Then his sister walked in and mocked him for being upset, saying his suffering wasn’t important in the context of what was happening. I could see both sides, but it interested me, the acceptability of her harshness, this expectation to just be totally absorbed in the cause to the exclusion of other personal desires for one’s life. But actually it is quite hard to be emotionally involved with a general political situation all the time; there needs to be some personal breathing space. How was it describing Gaza? You have a very sensual way of writing about the place — it has this kind of dry, salty feeling. But as you mentioned, it is not an easy place to go. I was wondering about your personal relationship with Gaza, and how that influenced how you describe it. I was trying to peer in on it from outside. I lived in the West Bank for three months, and I have Palestinian friends from Gaza. I’d been there two or three times before 2000, so I had an impression of it, but it was remote. So I read personal narratives of people there. I read a lot of blogs, looked at news footage, Google images, and then just tried to imagine it, and talk to people who had been in similar situations about things like what the air smells like after a bombing. You are never quite sure of whether you have captured the feeling of a place, and when I went into Gaza earlier this year with PalFest [the Palestine Festival of Literature], I was walking around wondering if I had got it right. I had research questions in my head from when I was writing, like do you have guys with ponytails in Gaza, and if so, how are they treated? Are there cafes and if so, what are they like? And most of the time I felt I had captured the sense of it. One Gazan journalist wrote to me after reading the novel saying it was as though I had lived in Gaza all my life, how had I done it? Which of course was satisfying. I felt sometimes when I was there that maybe I had got the tone a bit wrong. I would meet people who were upbeat and positive and I would think the novel needed more lightness, more hope, and then I would hear about some really sick political machination and feel that the novel should have been darker. But I was quite pleased, actually, with how much the real Gaza resonated with my fictional depiction of it when I went there. Not that I am pleased about the state that Gaza is forced to be in, but I felt that I had not done it a disservice by conveying it in the way that I did. That sounds like a very nerve-wracking situation when have already published the book! Yes, it was. But in some ways the book has been pitched as more of a Gaza novel than it actually is. I very much designed it as a Palestinian novel, and I wanted these three locations connecting the diaspora — Gaza, London, and the Gulf — to draw out the connections between Palestinians no matter where they have ended up. I chose Gaza for the central action in the novel because I felt it was the extremity of the Palestinian situation with the closure, the airstrikes, the high refugee population. I also wanted to write a Palestinian novel that could connect Palestinian experiences and so if my Gaza was not identical with the real Gaza that was okay — it was an imagined Gaza which conveyed Palestinian experience, and that in itself was important. It is an extreme setting. Gaza is this place that is impossible to get out of, nearly impossible to get into, and for me it is really hard to imagine life there. The West Bank doesn’t exist under such extreme conditions. You still have this sense of imprisonment in the West Bank but it is not always quite as intense, although the Separation Wall and the number of checkpoints in the West Bank traps the population there, too. Everyone says this is a big prison, in Gaza — everyone. I felt when I was in Gaza that I could not have written that book, had I lived there. The situation there on a day-to-day basis is so disruptive that I think it must be a real struggle to write longer works in that situation. There is a very talented writer, Samah El Sheikh, who I met when I was there, who writes very short pieces which are very good — but I can see why she prefers using the short form. You are not in control of your time or space if you live there. I think if I lived there, I could have also ended up writing something that was too journalistic, depicting the situation too closely in a realistic way. In Out of It, I wanted to draw away from factual realities to give my characters the freedom to move in a fictional space. I did not want to depict it historically, partly because I felt that if I did I would end up in arguments about factual details, which was not the point of the book, that is something for non-fiction. I was not trying to describe actual incidents, just things that have happened to Palestinians, but not necessarily in the order or in the particular place where they happened. Did you mean for the British characters to be a critique of certain Western attitudes towards Palestine? Well, it is very difficult because when the book first came out I would select certain parts to read, and I would look out at the audience and it would often be full of British activist women and I worried that they would find my depiction of Rashid’s girlfriend Lisa to be offensive. I would look out and think “Oh my God! I can’t read this!” I made Lisa quite extreme, mostly because I wanted to show how it feels to have these expectations on Palestinians from non-Palestinians, as well as their own peer groups, to somehow perform politically — particularly on Rashid, who is not particularly interested in living this identity all the time. Lisa is quite unlikeable. As time goes on and I have met more activists and people who work with Palestine, they always cotton on to Lisa and say “Oh, I know people just like her.” They identify with it; they know that type. Yesterday, I was giving a talk at the School of Oriental and African Studies [at the University of London], and there was a bit of a debate about ‘internationals’ [international aid workers and volunteers in Palestine] and how they are treated and viewed. My general approach is that Palestinians should be inclusive as possible, but patronizing, self serving and self-righteous attitudes do exist. That tension is strong in the sense of confinement that runs throughout the book, and is present in the title as well — it’s not just physical confinement, but also a kind of existential confinement: not being able to escape the political condition of your own life, no matter where you go and no matter what you do. Yes, that is exactly it. The characters are in a no mans land, in terms of geographic and political space — stuck between causes. The book will be out in Arabic next year, and it has been hard to find a way to translate the title, Out of It. One aspect of the English title was about trying to get out of a geographic space, then also out of a political situation, and finally just being out of it in terms of being stoned and zoned out. And at the end, there was an idea of freedom being built through some kind of engagement, even though the action was not as grand as it was meant to be. It was all that was available for that character.